Online sales are getting more and more popular today. Black friday and cyber monday the biggest US online sale is just upon us. More recently “Singles Day” in China, the holiday when online retail giant Alibaba encourages single people ( as opposed to valentines day) to celebrate and buy presents for themselves broke online sales records in China. Alibaba says that over the course of 24 hours, Chinese shoppers spent $17.79 billion on the site. So lets celebrate this mega online cyber sale event by snagging some deals for ourselves. 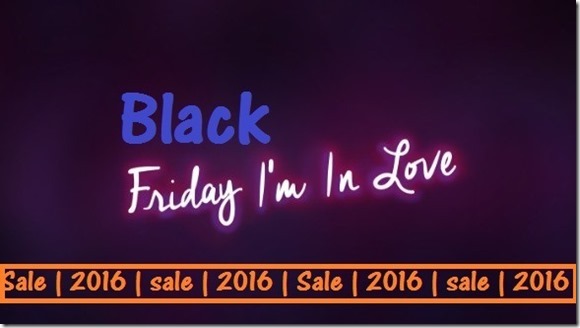 below is collection of deals that i could collect online for you – check ifg any interests you and grab it, as prices will return to normal after black friday and cyber monday. From Friday, November 25th 12am CST to Tuesday November 29th 11:59pm CST, we are offering an astounding 65% OFF ALL hosting packages and $5.99 on select domains. We are also sprinkling in 75% OFF Flash Sales plus $2.99 on select domains throughout the whole sale. Yes, you read that right! Black Friday SALE – Black Friday SALE – 65% OFF all new Hosting plus $5.99 on select Domains w/ promo code: BF2016. 11/25 12am-11:59pm CST. Black Friday 1HR ONLY – Black Friday 1HR ONLY – 75% OFF all new Hosting plus $2.99 on select Domains w/ promo code: BF2016FLASH. 11/25 – 12am-12:59am! Cyber Weekend SALE – Cyber Weekend SALE – 65% OFF all new Hosting plus $5.99 on select Domains w/ promo code: CW2016. 11/26 12am-11/27 11:59pm CST. Cyber Weekend Sale, 1HR ONLY – Cyber Weekend Sale, 1HR ONLY – 75% OFF all new Hosting plus $2.99 on select Domains w/ promo code: SAT2016FLASH. 11/26 – 3am-3:59am! There is nothing not to love with this great value coupon codes from go daddy. If you are just looking for a 99cents domain name or for a $1 hosting account, we got a deal for you. Check out our best discounts with the most popular deal codes that people use from our website! Godaddy – AUS$ – 30%* off! Get going with GoDaddy! Godaddy – $1*/ mo WordPress hosting! Get going with GoDaddy! How to claim these coupon code discounts? Black Friday Special! $2.65 ONLY for 36 month term on the Basic plan! Includes a free domain name! Get it here –> Black Friday Special! $2.65 ONLY for 36 month term on the Basic plan! Includes a free domain name! Cyber Monday FLASH SALE! $1.95 ONLY for 36 month term on the Basic plan! Includes a free domain name! Get it here -> Cyber Monday FLASH SALE! $1.95 ONLY for 36 month term on the Basic plan! Includes a free domain name! Who doesn’t love holidays. And when you plan one you always need to watch your budget while planning one, so why mot get a good deal on the biggest money stealer – The hotel accommodation. Get yourself a good discount on hotel accommodation and save more money for shopping and beers. Black Friday Offer: Buy one, Get one Free! This amazing software is pretty much an all-in-one online recording software and that’s the reason why I am writing about it. Besides being able to record streaming video and audio, this utility offers the ability to convert videos between different formats to play on your tablets and smart devices like phones. So what can Audial 1 do? It can easily record audio from streaming podcasts and music streaming stations. This software pretty much gives you the ability to grab any unprotected and protected media from the Internet and save/enjoy it on your PC, smartphone or tablet – anywhere and anytime! Namecheap Domain and webhosting – > Namecheap’s Biggest Sale! This is the best buying opportunity of the year to grab a new domain, level-up a hosting package, and lock up a business security with an SSL, all for less than $3. Namecheap is offering domain registration, website hosting, and SSLs at up to 98% off our already low prices. Get Discount here – – > Namecheap’s Biggest Sale!